With A, make magic circle or ch 3 and sl st to 1st ch to form loop. Row 1: Ch 1 and work 6 sc into loop. (6) Don’t join your rounds. 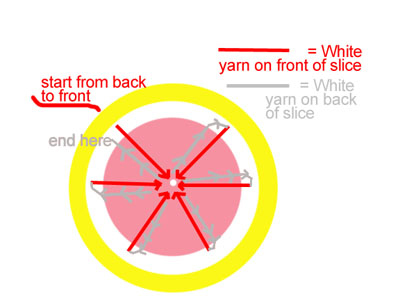 While you are creating a circle, you’ll be working in turned rows in order to make a slit in the circle so that we can twist the whole slice later. Row 4: Ch 1, turn. [(2 sc), 2 sc] 6 times. 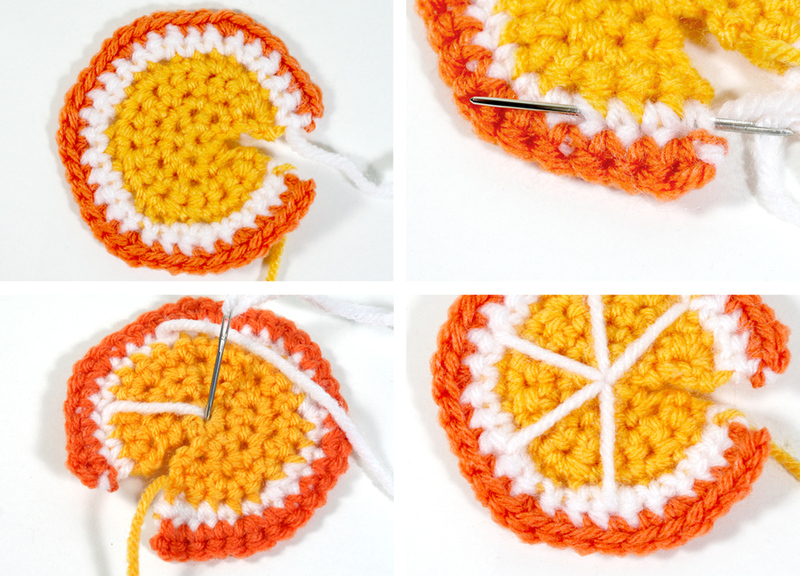 (24) Break off A, leaving a long tail (18 inches) for sewing your Citrus Twist to your cozy later. Join B. Row 5: Ch 1, turn. [(2 sc), 3 sc] 6 times. 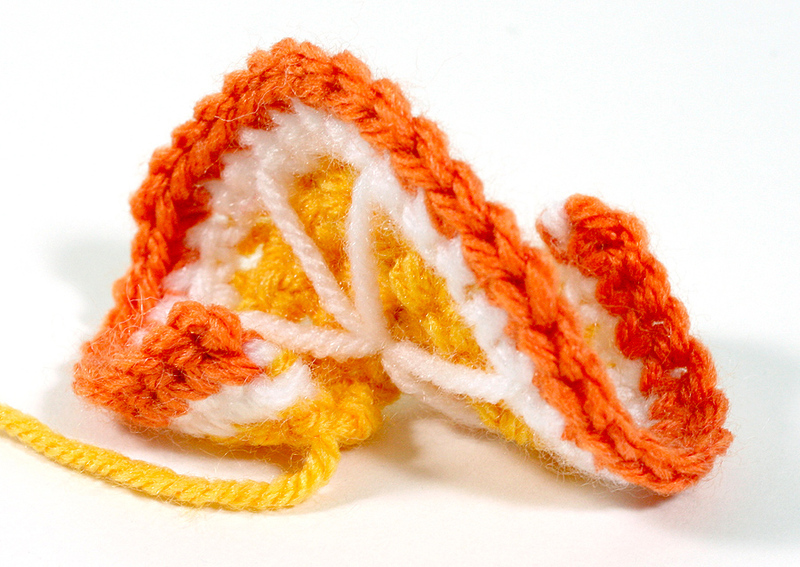 (30) Break off B, leaving an arm length of yarn to create the white wedge lines. Join C.
Row 6: Ch 1, turn. [(2 sc), 4 sc] 6 times. (36) Break off. Weave in your short ends, but leave the long tails from A and B. 1. With a tapestry needle and your long tail from B, create the white wedge lines in your slice. 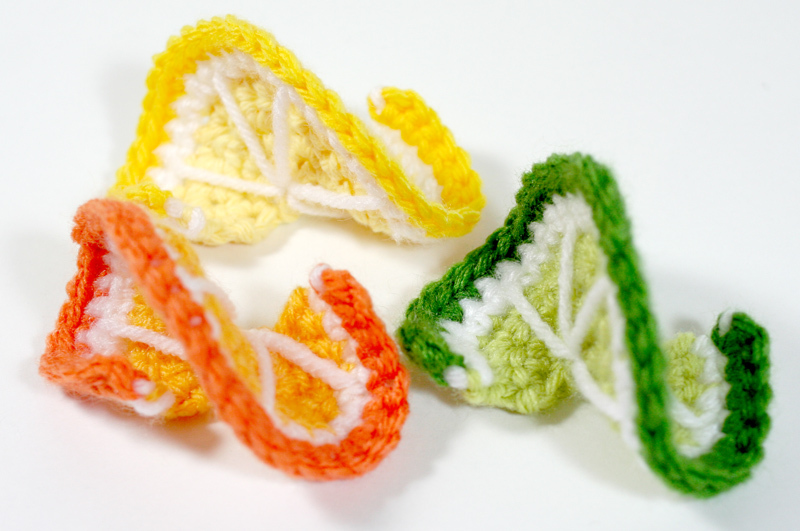 I use the same technique to do this as I do in my pattern for the grapefruit scarf. You should weave the yarn through a few stitches first to begin your first line. Here is the diagram. 2. 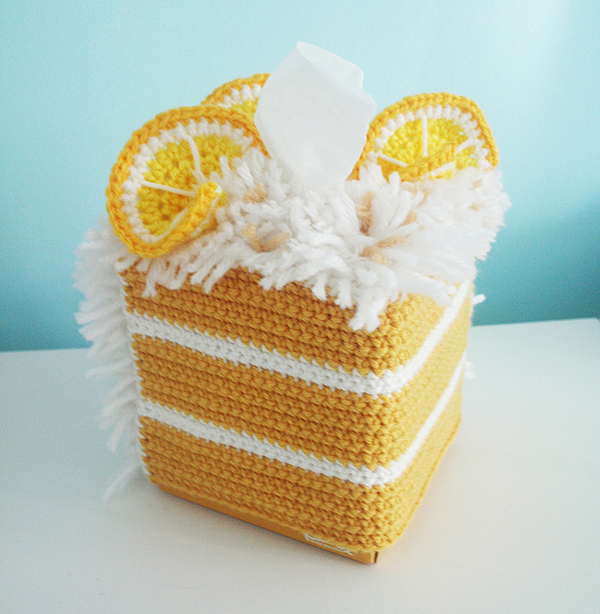 Now you’re ready to sew your Citrus Twist to the top of a tissue cozy. 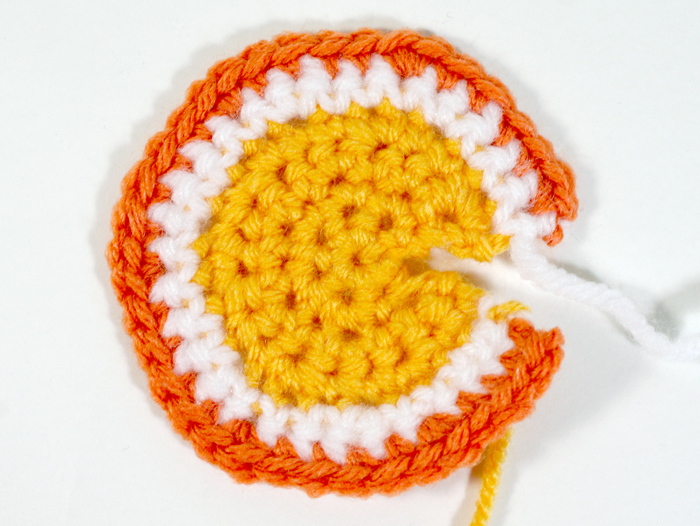 Twist the free ends of the slice into opposite directions to create the curl, and then sew the slice with the long tail from A into the cozy in a straight line where the slice touches the cozy. You will probably have to weave the lime green yarn through a bit so that the curly ends can remain unsewn and free to curl up. 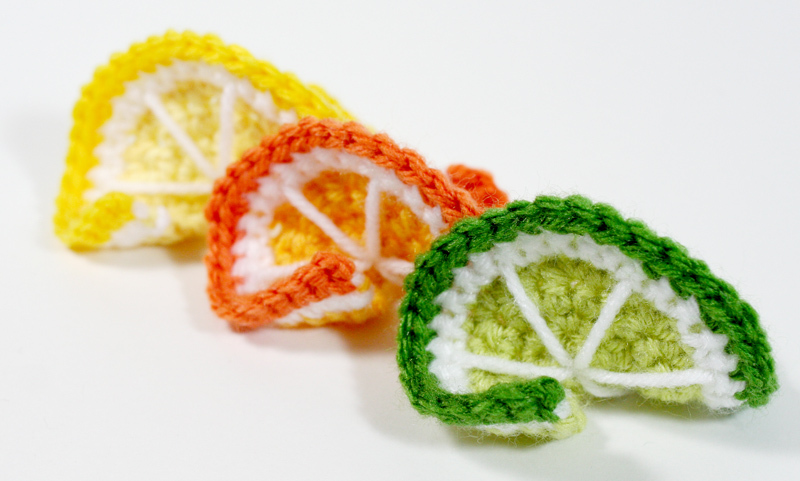 I arrange all my citrus twists first before sewing down, so that I can get an idea of where they will all fit, and then pin them into place. 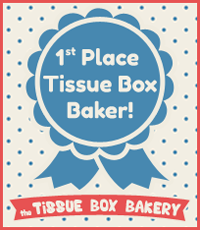 Be aware of hole for the tissue and don’t sew anything over it! Love this patern. Thanks for sharing.